Thank-you so much for the additional pictures of our Bella. We are so excited about seeing her for the first time, especially our 5 yr old granddaughter. Your Welcome! She is doing great! If Scarlet O Hara is the name you've decided to name her. I will start calling her by her name. And I have my pups as my screensaver too...LOL. Hi Karen, Glad you are excited about your newest family member. :) She is doing great! They started crawling around & trying to walk today. :) When she starts running around & getting her little personality. I can send you a video. You may decide on a name then. :) Sorry, for your loss with your Rocco. I know how hard it is to lose one. Although a new puppy can't take his place. I hope that she will bring you & your family joy . Hi! 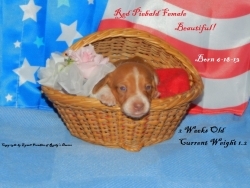 We just made our hold deposit on our newest family member last night--red/white piebald female. I am BEYOND excited. I am thinking of names but know I need to see her little personality first. I read all about her parents on your site and know she's a perfect fit for our home. 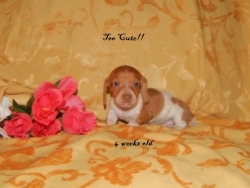 My sweet Rocco--my first red/white piebald and first and minidachshund--who has passed, was my angel. He is sooo missed and I know he had a hand (Paw:) in her coming to us. Can't wait to meet her!!!!! See you soon. 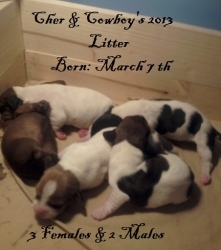 Cher had her Puppies had her litter on March 7 th! Three females & two males. After contacting my waiting list we have one male & one female available. Yaaay, It's finally March! We have two litters coming up. Cher is due Wed March 6 th. Give or take a few days. Amber is due March 13 th. We are sooo excited & expecting some really pretty puppies. I want wish all of Cher's puppies from her 2012 litter a Happy Birthday !!!! They are a year today! 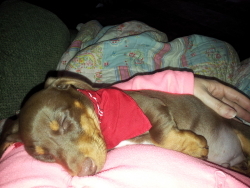 Roux is so loving, sweet & spoiled rotten! He loves to sleep most of the day and wants to be rocked like a baby. He's eating Science Diet 3 times a day plus Nuvet Vitamins at night. Potty training outside is going very well. 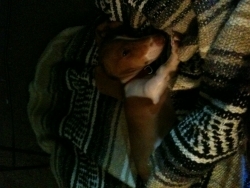 He slept in his crate / kennel until 4a.m last night/ this morning before waking to Potty outside. ... we were so super eexcited. He rides to school every morning & again every afternoon to see his two big sisters off. He is loved so much by our family. Thank you Lynell for every thing. The Rabalais Family. Hi Mandy, Your welcome. :) And no problem. :) I plan to take some more of him before his litter mates start going to their new homes this week. I also look forward to meeting you & your family.I also look forward to watching Roux grow into a happy healthy adult Mini-Dachshund. 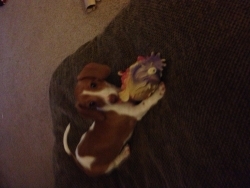 He weights a total of 6.4 lbs and loves pig ears and his new super squeak toy! He is the friendliest little dude to every one. And we had a name change lol. He is a Toby now :) my brother convinced me he wasn't a Chipp he was a Toby. Toby has even agreed! Lol! He is doing great with His favorite toy! Made it through Isaac. But had alot of damage. Just now getting everything back to normal. Shane, Glad Arley is doing so well :)) I understand about the pics I had to get my daughter to show me lol.